So, KCWC is over. I didn't finish everything I'd cut out, so I guess we can officially call me Over-Ambitious. And with Caitlyn's illness last week, I still have one item left to do. That one will wait - I have 57 siggy blocks to make! But first: the other things I did finish. Can I say they are KCWC finishes if they weren't finished in the proper week since they were part of my KCWC plans? 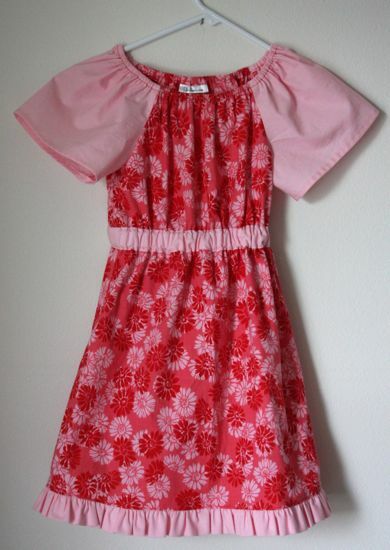 This is McCall's 6062, view A, cousin to this dress. I've not made a lot of tops, if you don't count shirts for Ian, which could explain why this looks more like a dress than a shirt. Tunic? Is that the technical term? The red floral is an inherited something that's been in the stash for years. 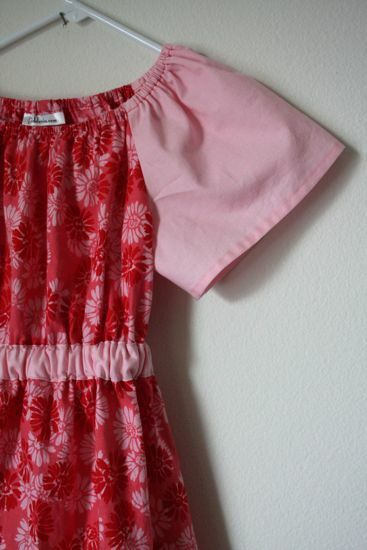 I've thought about turning it into a dress for Caitlyn since she was about 3. The pink is a Kona, although I couldn't tell you which one. I gave the blind hemming thing another whirl, thinking the thinner fabric would result in something more... well, blind than the hem on the purple shorts. At first, it didn't look too promising. A good pressing and the hem is much less visible. I think the stitches are still bigger than I'd like them to be, but maybe that has to do with how I'm folding the fabric or using the blind hem foot? Caitlyn's first thought at seeing this was that it was a dress. It's just a tiny bit too short to wear without something underneath (although if I'd added an extra inch above and below the elastic band in the middle it would totally work). The photos on the pattern envelope suggest this should be worn with pants (the pattern includes elastic waist pants), but I'm pretty sure their version is shorter than mine. When Caitlyn put this on over jeans yesterday morning, I was less than enthusiastic. It's too short to be a dress and too long to be a shirt. And I really don't like the dress-over-jeans look. Maybe it would work if the pants were not jeans? We'll see if we can't find some black or grey leggings and see how that looks. Alternatively, I've made a top that should look great with jeans in about a year or two. I'm right there with you on the blind hemming. I've tried to make the stitches smaller and then I get skipped stitches and that looks even worse and is not secure. So I only use it to hem dark things that just wouldn't look right with a top-stitched hem but are long enough to catch shoe buckles if hemmed by hand. Yours looks much better than anything I've done. Happy Mother's Day and Happy Sewing!